Today's post is the seventh installment of the Cottage Cooking Club a virtual cooking group started by the talented Andrea of The Kitchen Lioness. We are currently cooking our way through the River Cottage Veg, by Hugh Fearnley-Whittingstall. Every month Andrea picks one recipe from each of the ten chapters. We then pick and choose which one or ones we want to blog about in a single post. For the month of November I prepared two of the recipes. For the first recipe I prepared was the twice baked potatoes. It’s been years since I have had one and these were so good I ate the whole thing at one sitting. The recipe was easy to follow and simple to prepare. There are so many ways to dress these up, but I followed the recipe exactly as written using cheddar cheese, green onions and sour cream. The next dish I prepared was the stuffed cabbage leaves. The preparation was quite lengthy as there are many steps. First you are instructed to make the sauce. A humble mixture of tomatoes, carrot, celery, onions and garlic. The sauce was very thick and had to be spooned over the top. Next step is to blanch the cabbage leaves and then make the filling. The filling consist of barley, onions, walnuts and herbs. This mixture was then rolled in the cabbage leaves, topped with sauce and dolloped with sour cream. I would make this again but with a thinner sauce. *In the variation notes grape leaves, Swiss chard or kale can be substituted for the savoy cabbage. The trick is to remove the stalks and then blanch the leaves a minute or two to soften. Recipes have been adapted from the "River Cottage Veg", cookbook by Hugh Fearnley-Whittingstall. First recipe chapter Pantry Suppers, Twice-baked potatoes, page 226. Second recipe chapter Comfort food and feast, Stuffed cabbage leaves, page 38. 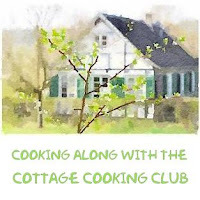 To see what recipes the other members chose for this month, head over to the LYL post for November on the CCC website, by clicking clicking here. What a lovely little 'project' you've got going there, Cheri! I love the sound of both of your first choices, although I have to admit the potatoes sound very appealing indeed. Delicious and comforting but easy to make as well! HI Helen, the potato dish was my favorite of the two, who could resist, cheese, green onions and sour cream. Thanks! The potatoes were my favorite too Maureen, but the little cabbage packets were pretty good and even better the next day. Thanks for stopping by! I love both of your delicious recipes. I know the second choose with stuffed cabbage is a lot more work but love delicious layering of flavors in this dish. Wishing you a restful weekend. Thanks Bam, I guess this is really the last week-end before the holiday to get in a small break. Happy Holidays to you! Thanks Sherry, I will not wait so long next time to make them again. 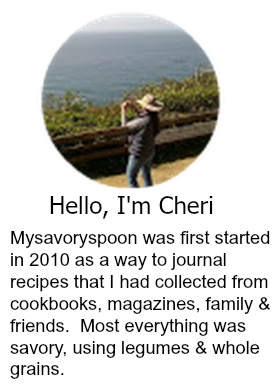 This sounds so fun, Cheri, and I love both dishes that you made! I haven't made twice baked potatoes in ages -- those sound so good! Thanks Marcie, it's amazing how a nice wonderful potato can be so comforting and delicious! Aren't twice-baked potatoes the best? Love em. I had the stuffed cabbage leaves on my list to make if I had extra time, which I didn't. Both your recipes look good. Thanks Cathleen, thank goodness we had a few extra days to post this month as time was getting away from me. Hi Tandy, I enjoyed preparing both the recipes, each was so different but enjoyable in their own way. Cheri, whta wonderful dishes you chose - thes are two recipe that I prepared as well and I can see why you chose them - the twice-baked potatoes look wonderful and so do the stuffed cabbage leaves - how that you cooked along with us this month again! MY post will be up later today! Hi Andrea, I was just thinking we only have 3 months left, will be sorry when it ends. Thanks for all you do! Those twice baked potatoes are looking so good! Thanks Angie, I really enjoyed them! What a fun cooking club! Both dishes you made sound so good! I love twice baked potatoes and haven't made them in a while too. This is such a great reminder - both dishes look great! Thanks Kelly, it is a great cooking club, I'll be a little sad when we are through with the book. Both dishes look great, Cheri. I love twice baked potatoes and really don't make them often enough. It looks as though your stuffed cabbage turned out well with the cabbage properly cooked - clearly savoy was the way to go since the green cabbage I used was underdone. Thanks Zosia, this was a fun month. Those potatoes Cheri...all I can say is YUM! Hi Monica, bacon and cheddar sounds delicious, I will have to try that next time, thanks! Hi Cheri, Hope you had a lovely Thanksgiving. I enjoyed seeing your preparation of the cabbage stuffed with the barley and had been curious about it so perhaps it is worth a go. I didn't make the twice baked potatoes since I had earlier planned on doing twice baked potatoes for a post, and then, when I saw they were pretty much identical in ingredient preparation except for fresh parsley at the holidays, I decided to make a couple of the other lovely choices for the month. Wishing you a happy season ahead. Thanks Peggy, can't believe we only have 3 months left, having a great time. Thanks! Nice choices, Cheri! I especially like the look of those twice-baked potatoes. We were at someone else's house for Thanksgiving, so will prepare a "make up" turkey in the next week or so. I think these potatoes will be the perfect side! I'm trying to like cabbage more than I do, so the stuffed ones look like something for me to try. I hope you had a great holiday! Hi Betsy, I thought the cabbage rolls tasted better the next day, I guess the flavors needed to little time to set. Happy Holidays to you! Hi Dena, I will have to rein myself in to make it through the holidays, but the potatoes were my favorite out of the two I prepared this month. It looks like you picked two winners! We love twice baked potatoes around here, too. And I grew up eating stuffed cabbage and this variation sounds tasty! Thanks Liz, we enjoyed them. Happy Holidays to you and your family! Those potatoes sound heavenly. I need to add them to my potato rotation. Thanks, Cheri. Thanks Abbe, I'm a potato fiend anyway, so I really enjoyed these. Thanks Charlie, this was another great month cooking along with the CCC group. Having fun! Those twice-baked potatoes look amazing. Those are seeing my dinner plate! Thanks Francesca, they were delicious! Baked potatoes are stuck in my mind now! Have to make some! Hi Ela, the same thing happened to me after I saw the recipe. Thanks! Great idea to work your way through a cookbook, Cheri. I haven't made twice baked potatoes in years! Or stuffed cabbage. Two winners. Thanks Barbara, it's been ages for me too! MMMmmm, that stuffing in the cabbage sounds divine, Cheri! You are so ambitious with all your creative dishes! I love both of these and like you, haven't had twice baked potatoes in ages. Great recipes! I love that cookbook! Both recipes look great. I'm enjoying following your group as you try recipes together each month. Thanks Beth, you should join us, we are having a great time. Thanks, we really enjoyed them! I could eat the whole plate of twice baked potatoes! They are truly one of my favorites. Hi Amy, me too, they are so simple and comforting! Both dishes look wonderful, Cheri! I know I would love them. I adore twice baked potatoes, any potatoes really, but this is one of my favorite ways to eat them. The cabbage dish looks very appealing as well with all of those flavors and the sauce. Thanks Shari, I had not prepared either dish in ages, nice way to bring them back. You made two of the dishes that I didn't and I especially wish I'd tried the twice-baked potatoes! I think I'd really enjoy the cabbage dish, too. Thanks Teresa, had a great time preparing these dishes, can't wait for next month's selection. Thanks Karen, it is a great book! I've made stuffed cabbage before and it is definitely a labor of love...though a delicious one at that! You are so right Joanne, but worth it in the end! Thanks! Hi Cheri, I love both these dishes but it has been so long since 'Ive made them.Your delicious photos remind me that its high time I made them again! Thanks Nazneen, it's been quite a while for me too, forgot how much I enjoyed both of them. Hi Tricia, yes, had a great Thanksgiving, thanks for stopping by. Mouthwatering potatoes and cabbage. Great food. Thanks Rosa, what a combination, right! The stuffed cabbage looks and sounds sooo good and worth a little time and TLC. I can see, too, Cheri why you would have the potatoes at one sitting...They look delicious, too!